XINCHANGZHEN, China – The default position when confronted by the police, in the United States or anywhere else, is to follow directions and be respectful. So when two police officers in a white and blue van blocked our vehicle, then deliberately strolled over to the driver’s side window to ask for my passport and the national identification card of my translator, I reminded myself that they’re just cops. Do as they say. It was Thursday afternoon, hot and muggy in a central Sichuan Province valley west of Weijuan, a city of 200,000 people. I’d come 140 kilometers south from Chengdu to find this valley, heavily settled by dusty roadside towns and dense corn fields and rice paddies, to see China’s first two producing shale gas wells. In the United States, horizontal drilling and high pressure hydrofracking in deep gas- and oil-bearing shales is generating a production and economic boom that is rewriting what we thought we knew about energy supplies. In November 2009, during his visit to Beijing, President Obama and Chinese President Hu Jintao signed an agreement to dispatch American technical expertise to help China understand and develop its shale oil and shale gas resources. A month later, on December 8, 2009, PetroChina, in partnership with Royal Dutch Shell, started drilling the first shale gas well here, designated Wei-201. It was completed on July 31, 2010, according to a sign at the well site. 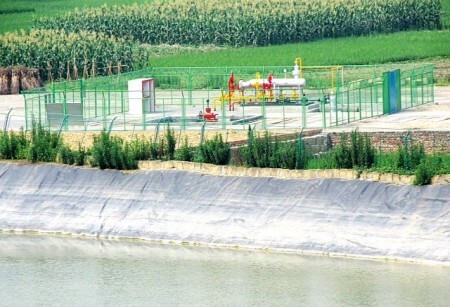 On May 5, 2011, the two companies started a second well, Wei-201H3 (see pix below). It was finished on October 2, 2011. Wei-201H3 is also the first shale gas well in China to use horizontal drilling technology. If China succeeds in developing its shale reserves — they are said by the U.S. Department of Energy to be even larger than the American shale gas reserves — the beneficial consequences to climate emissions, global energy security, and the Chinese and U.S. economies would be profound. That scenario would also place the Wei-201 and Wei-201H3 wells in the pantheon of historic sites for seminal breakthroughs in energy production, something akin to Stagg Field at the University of Chicago, where the first nuclear chain reaction occurred on December 2, 1942. Later this summer, in a report for Circle of Blue, I’ll disclose the details of China’s shale gas development that I collected during the week I spent in Sichuan Province. Naturally, as part of that research, I was intent on seeing the historic energy development sites with my own eyes. A blue and white sign on the main highway points visitors west, directing them to proceed about .8 of a kilometer along a narrow and deeply rutted dirt road to the two well sites, which are about a quarter-mile apart. It was plainly clear, though, that not everyone is welcome. 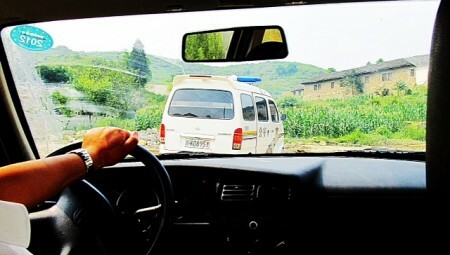 About fifteen minutes after I arrived, in the company of Wu Jing Yang, my 26-year-old researcher and translator, six brand new and spotless white and black Toyota SUV’s rolled up on us. The vehicles swept into a half circle and stopped. The doors opened simultaneously and out stepped 13 PetroChina managers, each of them wearing Communist red jump suits with yellow/gold piping. I counted a dozen men and one woman. The leader, a man named Li, questioned Wu Jing, asking her why we were there and whether she regarded herself as a Chinese citizen. He eyed my camera and ordered me to stop using it. I listened to their increasingly urgent conversation while making eye contact with the other PetroChina managers. They grinned at me and seemed almost embarrassed by their supervisor’s belligerence. The farmer left first and I followed him to his rice paddy. I learned his name was Liu Zhongqi, and that like other residents of the neighborhood of stone and wood houses closest to the well, he wasn’t happy. The development of the well and the construction of the 4-acre wellpad was viewed as a big disruption in their community. Supervisor Lee saw my conversation with Liu and stormed over in a gust of waving arms and verbal bluster. He demanded I leave. I complied and headed to the Wei-201 well to take pictures. It is located about a quarter-mile to the west and is reachable through a narrow road and tunnel that runs beneath an unopened freeway under construction in the region. About five minutes after we arrived at the well, another PetroChina employee rolled up on a motor bike and asked us to leave. I replied by asking him where he was from (the area, he said), how long he’d worked for PetroChina (nine years), and how much gas the well produced daily now (he wasn’t sure). He smiled and then pointed down the road. “You can’t be here,” he said. Then he took his cell phone out of his jumpsuit pocket and dialed the police. The two officers met us in the center of the village. Their police van blocked the muddy road. One officer directed us to follow them back to the station house in town, about a 15 minute drive. On the way over, I removed the photo card from my camera just in case they got aggressive and took the camera. I needn’t have worried. They escorted us to a second floor office, where sunlight streamed in from a big west-facing window. 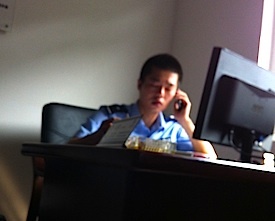 A third young officer took my passport and Wu Jing’s I.D. card, methodically filled in boxes on a single sheet form, and engaged Wu Jing in lighthearted chatter. His only question for me was why I was in the area. I replied that the two wells were significant to China’s economy and energy supply, and that the world was interested. Wu Jing translated and he seemed satisfied with that response. The officer handed my passport across the desk and pronounced us free to leave. 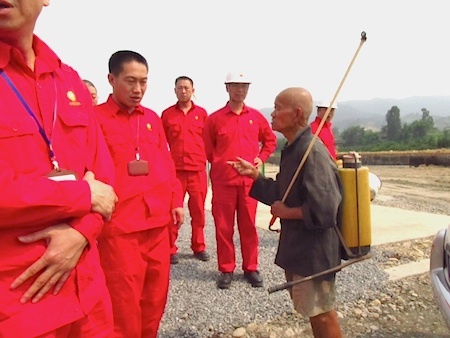 It was plain to me that he and his colleagues had met their mission — to accede to the demands of PetroChina, a state-owned and influential company, to temporarily remove us from the well sites. On the way out I asked another officer if I could return to the village to talk to some of the residents. He said that would not be a problem. “But no pictures,” he warned. Yes sir, I said. We shook hands.